BLOG | The Campanil wins six journalism awards! We bring wonderful news! The Campanil has won yet another smorgasbord of awards from the California College Media Association’s (CCMA) annual college journalism competition. We were competing against all California college presses in the 2011 non-weekly publication section. We are planning to raise funds for our trip to the annual Associated Collegiate Press (ACP) journalism convention during the weekend of March 3-6 in Los Angeles, CA and to attend the CCMA awards ceremony on Saturday, March 5, 2011. This convention is a huge opportunity for The Campanil editors to network with other national college presses and learn more about reporting at panels hosted by professional journalists. We ask for a donation in any amount payable via PayPal and thank you very much for helping make this school paper grow. You can contact us for more information via e-mail at eic [at] thecampanil [dot] com. Continue to follow us on Facebook, Youtube and Twitter. 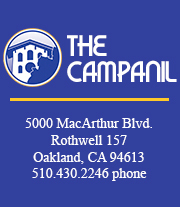 Donate any amount to The Campanil’s PayPal below. Thank you for your contribution, we really appreciate it! Read the The Campanil staff’s experiences at theACP 2011 convention in Hollywood, Los Angeles on our website’s special blog page. Congratulations to all of the Campanil Staff on these awards! Thanks for the support, Jessica!